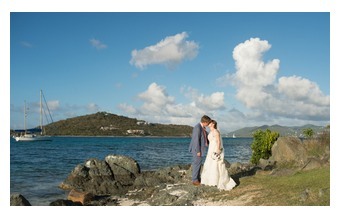 Weddings in St. John USVI, St. John travel, St. John vaction. - VisitStJohn.com In the US Virgin Islands. St. John is America's Paradise in the Caribbean. Many couples are opting to save the money (not to mention the stress and hard work) of a big wedding at home by escaping to a Caribbean island for a combination wedding/honeymoon. Upon their return, they can share the event by showing the video and photographs at an informal reception. All the islands are beautiful and, on some, weddings have become a major promotional tool. So why should you choose St. John above others? First are the practical reasons. As we are a U.S. Territory, there are no legal, language, or money hassles to deal with. No blood test or waiting period is required, and the simple application process can be done by mail. A local wedding planner can handle this for you along with your other arrangements, ensuring that all is in order before you arrive. Or you may contact the Territorial Court yourself, at (340) 778-9750. The license fee is $50 , and if you have been married before you will need a certified copy of the divorce papers or death certificate. You will need to pick up the license yourself on arrival; this only takes a few minutes but must be done on a regular business day. That takes care of the business part - then comes the fun of choosing from the numerous romantic ceremony sites around the island for the wedding of your dreams. On a mountain top or underwater, on a beautiful beach or in a botanical garden, in a formal church wedding or an African "Jump the Broom" ceremony, St. John has every imaginable setting, all with the island theme you desire. No matter which venue you choose, St. John has several experienced wedding consultants and planners who can help you arrange the perfect ceremony and celebration. 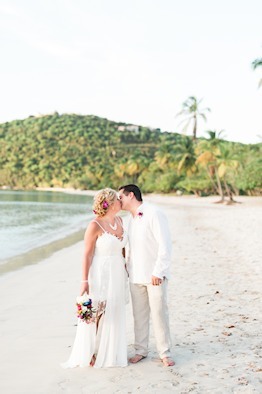 You don't have to go far to find your perfect honeymoon spot when you get married in St . John. Luxury resorts are available for couples who like to be waited on hand and foot. Intimate guest houses or condos are another wonderful way to spend your special time together. You may choose one of our many island villas, equipped with private pools, for a more exclusive honeymoon. Of course, there are private yachts available to charter for a customized honeymoon. VI Hummingbird Photography is based in St.Thomas & St.John in the Virgin Islands. Hummingbird has a passion to Photograph Destination Weddings, Engagements, Family & Lifestyle portraits using natural light and takes an easy going approach to making clients feel comfortable & capturing their best moments.